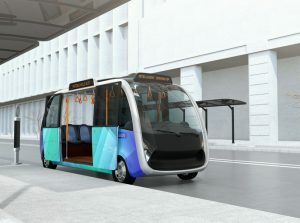 Low-speed autonomous shuttles will be a common sight in more cities shortly, as May Mobility announced its debut in Columbus, Ohio, and the launch of more shuttles in Grand Rapids, Mich.. The Ann Arbor, Mich., based company will have shuttles running in Detroit, Grand Rapids, and Columbus. The Grand Rapids shuttle is part of a larger autonomous cooperative–the Grand Rapids Autonomous Mobility Initiative–which has brought together energy, automotive, and other companies to study how autonomous vehicles affect cities and how they help or otherwise affect the mobility of disabled or elderly people. Its shuttles cover 3.2 miles and 22 stops, and are free for riders.